Ever since the remarkable Kendall Schmidt set foot in the entertainment industry, we all have been swooning over him ’till no end. The extraordinary Kendall Schmidt first stole the hearts of fans worldwide as a member of the boy band phenomenon, Big Time Rush. It goes without saying that everywhere and anywhere that this awesome band went, they always caused a pandemonium. After the band decided to move on with their own individual endeavors, Kendall Schmidt continues to take over the music world by storm. He has been devoting all of his time and passion into his alternative pop band, Heffron Drive, where he serves as the lead vocalist and his buddy Dustin Belt shreds it on the guitar. We all have tons of heart-eye emojis for everything that this sensational band works on. Kendall Schmidt and Dustin Belt never fail to bring out musical masterpieces to all of their fans and we can’t help but constantly listen to all of their music on repeat. It’s clear to see how much this exceptional duo loves what they do and we could hear their raw and genuine talent for music in all of their songs. Their recent single, “Hot Summer,” is yet another one of their many successful, hit songs and it is, without a doubt, everyone’s summer anthem. Heffron Drive has been keeping busy with a countless amount of magnificent projects to share with all of their fans. In fact, they even won Macy’s iHeartRadio Rising Star competition and will be making their way on over to Las Vegas to perform at the iHeartRadio Festival. From giving fans unforgettable performances to releasing epic songs and music videos, Heffron Drive was definitely destined to hit it big. With some more music up their sleeves (and a new song just recently finished), we know that Heffron Drive will continue to mesmerize everyone with all of their stupendous work. 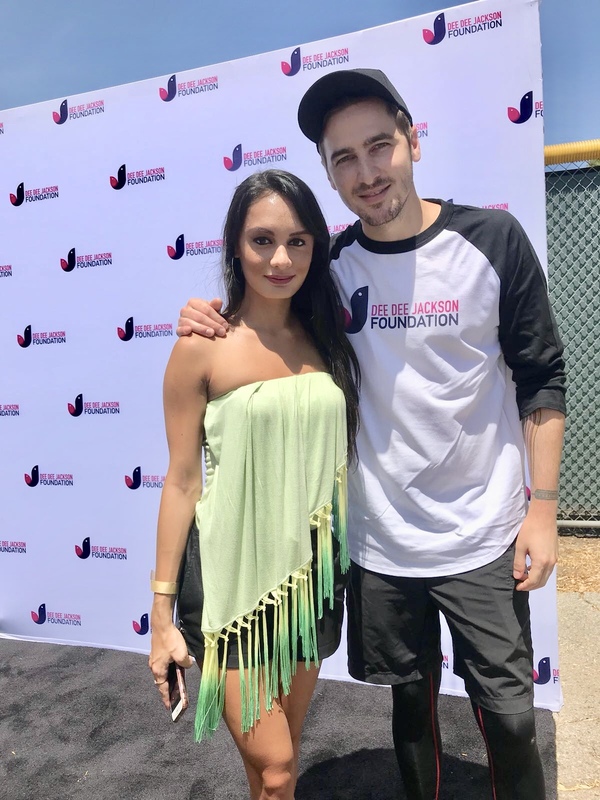 I, Alexisjoyvipaccess had a fantastic time covering the Dee Dee Jackson Foundation’s Celebrity Softball Game and had a terrific time interviewing the outstanding Kendall Schmidt at the event. Kendall Schmidt dished exclusively to Alexisjoyvipaccess all about what it was like creating the “Hot Summer” music video, what are some other upcoming projects that Heffron Drive is working on that fans can stay tuned for and so much more only in our VIPAccessEXCLUSIVE interview. Kendall Schmidt even took on a fun speed round and revealed what his favorite song at the moment is, something that fans may not know about him and more – hear what he had to say in our VIPAccessEXCLUSIVE interview below. Thanks for the fun interview, Kendall! Check out my VIPAccessEXCLUSIVE interview with the musically-inclined and brilliant Kendall Schmidt at the Dee Dee Jackson Foundation’s Celebrity Softball Game below! Previous VIPAccessEXCLUSIVE: UFC Legend Chuck Liddell Interview With Alexisjoyvipaccess At The Dee Dee Jackson Foundation’s Celebrity Softball Game! Next VIPAccessEXCLUSIVE: Actress And Improviser Lisa Linke Talks About Working On Amazon Prime’s “Successful People,” Guest-Starring In “BUNK’D” And More In Her Interview With Alexisjoyvipaccess!